I’ve been listening to a lot of Joe Sample’s playing recently – mostly by way of listening to The Crusaders. Struck me what a great player he was, especially on the Rhodes – I play Streetlife with the band, and I usually end up quoting (or just copying) Joe’s own solo to that great track. I have it pretty much down pat now, so when I get round to it, will try to notate it and post it as a download. 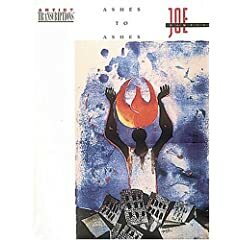 In the meantime, check out Hal Leonard’s transcriptions of Joe’s album ‘Ashes to Ashes’. I’m not the biggest fan of the album itself but (I think it sounds a tad dated) although Joe’s playing is as good as always. This book is a spot on reflection of what Joe plays, and there are some top solo’s on there. So until a newer – more varied – folio arrives of Joe’s work you’ll have to make do with this…..
Is this book still online for download? I have been looking for a copy for my father, however the only place I have seen it has been on amazon. They crooks are asking $190+ for the book! I have a horrible feeling it is out-of-print. I seem to remember I picked up my copy very cheap, second-hand. It could be worth contacting the publisher , Hal Leonard (www.halleonard.com) to ask them…? I did and it is out of print. I have been trying to find a second hand music store that would have a copy, but that has proved to be a difficult task. Nice one John, many thanks for that link! I have a copy of the Joe Sample book Ashes to Ashes if any one needs a copy of a tune of the book!